Here, we introduce popular Teishoku of our time. Keeping the basic style of rice, soup and side dishes, the menu of side dishes has come to be of great variety, both eastern and western styles. Hope the pictures won't make you too hungry! Produced by CHEF Co., Ltd.
Japanese food culture co-exists with nature. Two third of Japanese land, which is 3,000 km in length, is mountains and Japan is an island surrounded by four currents. Japanese people have learnt to appreciate and enjoy the seasonal fruit of the mountains and the sea. In order to enjoy Japanese born Teishoku more, here, we look into Japanese distinctive food culture a little deeper. 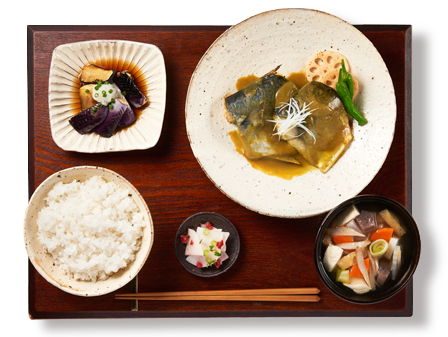 Japanese food is about appreciating natural bounty provided by four seasons and other Japan's distinctive geological trait. Dishes embody transient moment of each season by incorporating seasonal ingredients. Every ingredient has the state of first, in season and remnant. 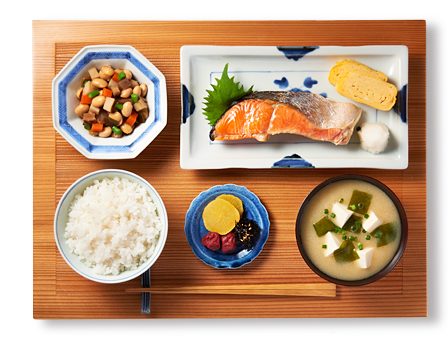 Appreciating a sense of four seasons through ingredients is an important characteristic of Japanese food culture and Teishoku inherits the sensitive spirit. Since Japanese food is about appreciating natural bounty, people have respected and fostered a sense of gratitude toward nature. We say "Itadaki-masu (we receive)" before eating and "Gochiso-sama-deshita (thank you for the meal you prepared)" after finishing one's meal. Both phrases embody Japanese people's sense of gratitude toward food. "Itadaki-masu" and "Gochiso-sama" are directed not only to those who cooked the food but also to those who farmed the vegetables as well as the lives of animals themselves. Appreciating every aspect involved in the food in sight is a spirit of Japanese food. People say "you are what you eat". Being aware of what you eat and how you eat it makes one's life more colorful.We should also enjoy our food visually, while being grateful for great nature. 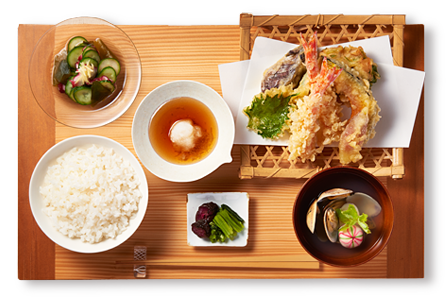 Teishoku brings all the vital aspects on our table and we hope to hear more "Itadaki-masu" and "Gochiso-sama" through out the world. 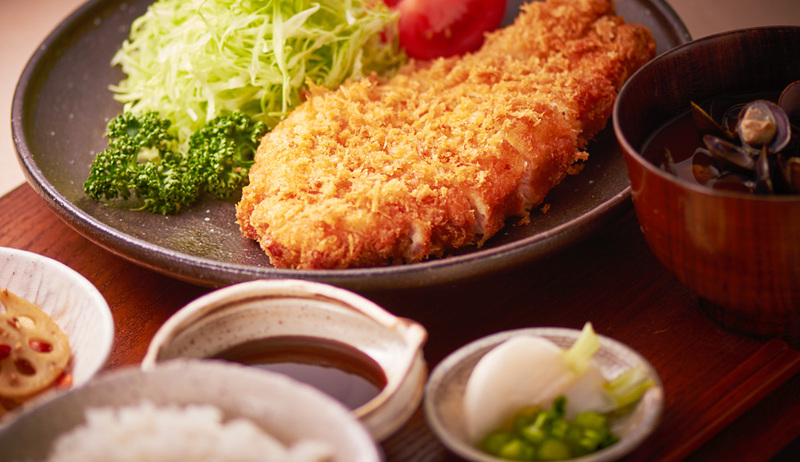 Tonkatsu is deep-fried breaded pork loin or medallion. It is often served with Worcestershire sauce. Breading thick slices of pork seals juiciness of meat inside while finishing outside crispy. Tonkatsu is one of the popular Japanese food among non Japanese. 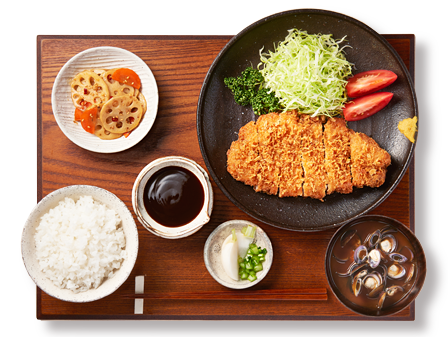 It is beleived the origin of the word Tonkatsu comes from cutlet in French. It was introduced to Japan in the late 1800s. People used to shallow-fry pork with less oil in the beginning and started to cook like what we know of today 60 years later, in the begging of 1900s. Ground meat is mixed with chopped onion and bread crumbs and kneaded well before being shaped. Depending on the kind of meat, binders and seasoning to use, there are different variations of hamburg. It is very popular among people of all ages in Japan. People also enjoy healthier hamburg using Tofu or soy pulp as binders. 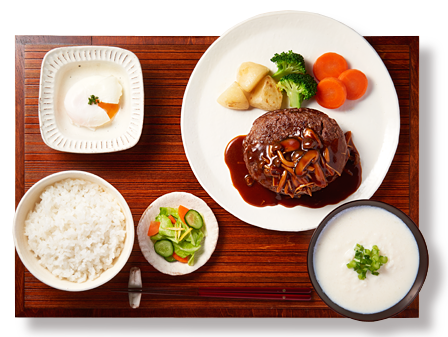 Hamburg steak was introduced to Japan in the late 1800s. It is believed it was at the opening ceremony for Akahori Cooking School, the first cooking school in Japan, located in Nihonbashi, Tokyo, that people ate hamburg steak for the first time. 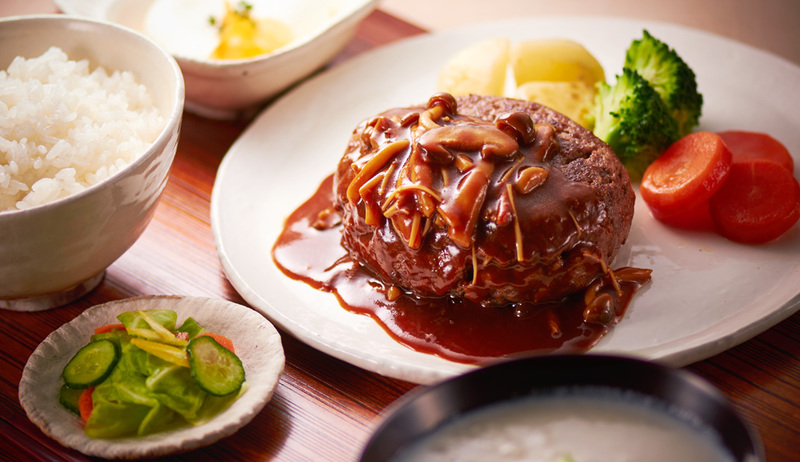 Japanese style hamburg with grated Japanese radish on top and Teriyaki hamburg have evolved from the original recipe and become widely consumed in Japan. Sprinkle salt on fish in order to get rid of excess water and smell of the fish before grilling. Japan is an island and blessed with fresh fish. It is a simple way of cooking to appreciate seasonal fresh fish from the sea. We can enjoy the flavor of fish itself in this way of cooking. Each fish contains fattier or leaner parts in its meat. Enjoy the different textures. Grated Japanese radish is a must-have topping on gilled fishes. It terminates unfavorable smell, helps digestion, prevent food poisoning and more. Citrus such as Sudachi and Kabosu which refreshes fattiness of fish is often accompanied too. And soy sauce enhances the roasted flavor of fish. 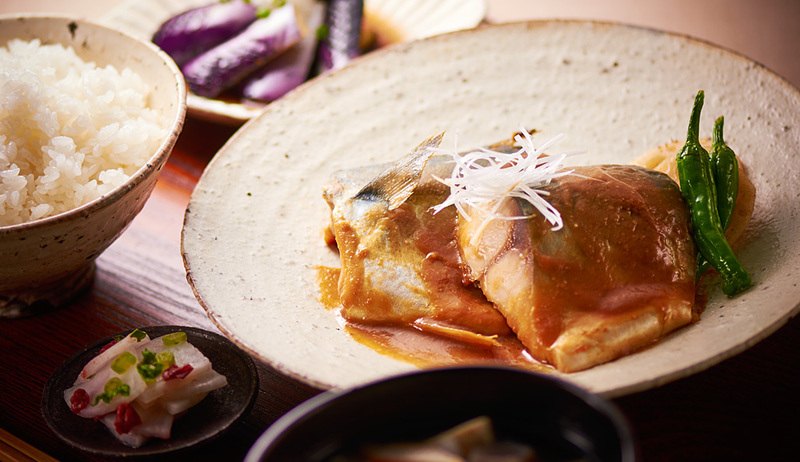 The dish is full of Washoku wisdoms to bring out the favor of ingredient itself. Cooking mackerel in Miso, a Japanese traditional fermented food, brings out the flavor of the fish. Miso seals the flavor and keeps fish juicy. The combination of richness of Miso and mackerel’s fat is a great match for rice. 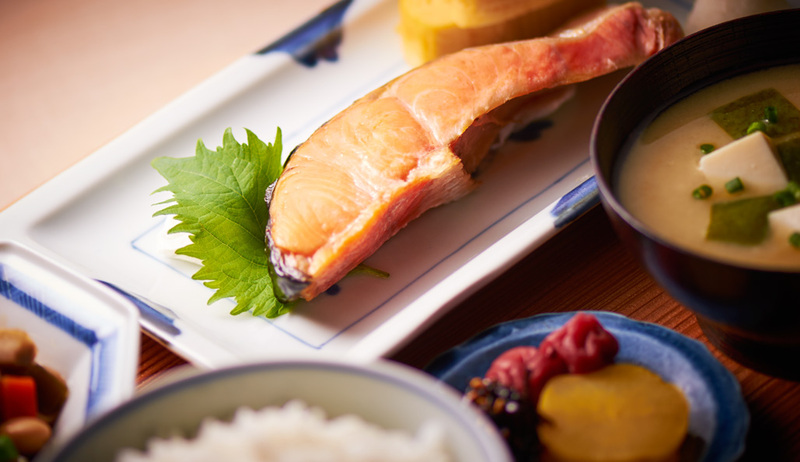 It is another wisdom of Washoku, whose speciality is in fish, in which Miso transforms the distinctive smell of mackerel into umami. Miso is an integral seasoning for Japanese food, just like soy sauce. The basic ingredient differs from soy beans to rice or wheat depending on regions. There are variety of flavors from sweet and dry. For this dish, Miso with fine and smooth texture is suited so that it won’t interfere with the texture of fish meat. Despite the variety in flavor, Japanese people have consumed Miso through out Japan from olden days. 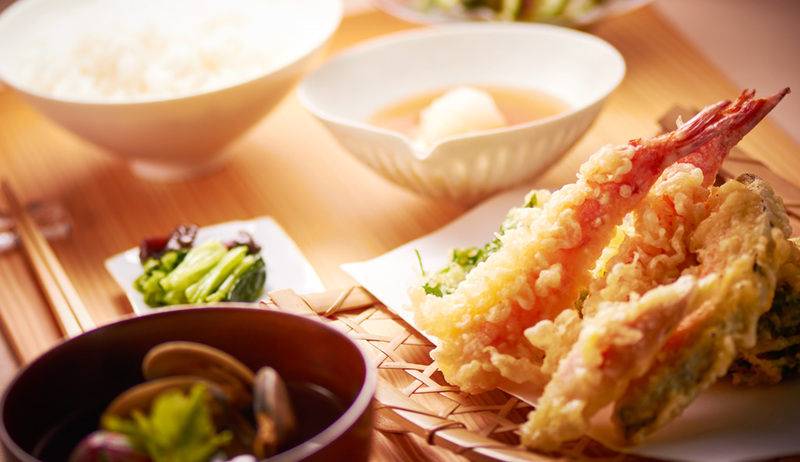 Tempura is a dish of seasonal seafood or vegetables that have been battered and deep fried. Cherishing the flavor of ingredient itself, one has to time the moment when inside is still juicy while outside is crispy. Tempura embodies Japanese aesthetic that cerebrates the changing seasons. The sound and smell of cooking Tempura is part of the dish. People add sesame oil in order to enhance the aroma in some regions. You can also be creative on the batter by adding rice crackers or sesames to enhance the crunchiness. Some people like to dip it in the sauce when eating and other like to eat it with salt. Tempura is a popular dish among Japanese people. Sukiyaki is a hot pot dish in which thinly sliced meat (mostly beef) is cooked in say sauce and sugar together with other ingredients. People fry meat first before seasoning in the western part of Japan, whereas people cook it in prepared broth in the eastern part of Japan. Beef is the common ingredient though, port, chicken or fish also works very well with the recipe. There are different stories about the origin of “Sukiyaki”. Some say people used to use spade, Suki in Japanese, to cook the dish in stead of pot. Other say it comes from thinly sliced meat, Sukimi in Japanese. 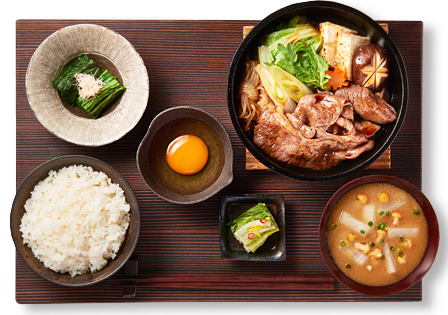 Either way, Sukiyaki is a popular dish among Japanese people. 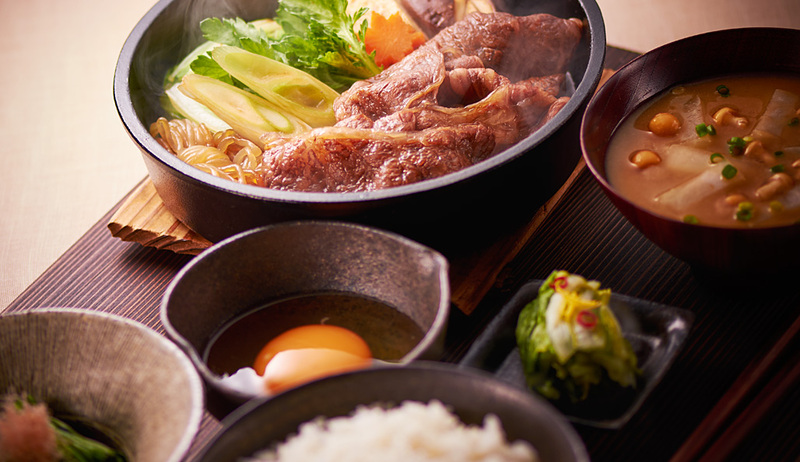 More and more people started to enjoy Sukiyaki as the then government lifted the ban on meat in the Meiji period and beef became accessible through out Japan.